Ok, it’s been a while since I’ve added any recipes to the site…but it’s busy here. There’s a long backlog of photos from great recipes we’ve found. That’s one thing about doing this site that always amazes me, week after week, I can find 5-7 new recipes to try for dinner, most of which are really yummy and not too hard to make. There’s so many food blogs out there that I keep finding new ones. 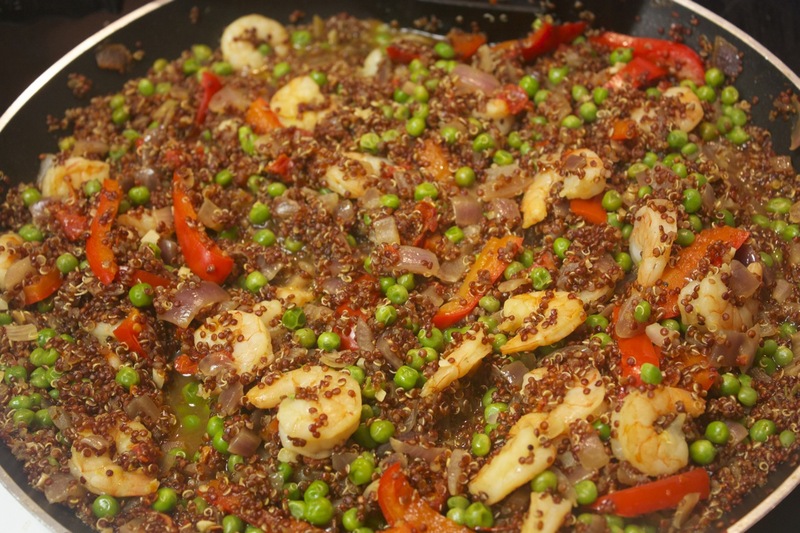 Like SkinnyMs.com, not a site I would normally have found, but I was looking for shrimp dishes and wondered about adding quinoa to help make a filling meal while keeping the cost down…and that’s how I stumbled across this Quinoa and Shrimp Paella. We first made it a couple of weeks ago, but one of the kids requested it again, and it was yummy so we made it again. The one thing that we’ve changed is to up the cooking time. We’ve found that it takes another 10-15 minutes in that last step to finish absorbing the chicken stock and make sure the shrimp is cooked through. A delicious and healthy twist on a classic Spanish dish. In a large skillet, heat oil to medium-low and sauté onions until tender, about 5 minutes. Add bell pepper strips and sauté an additional 4 minutes. Add quinoa, chicken broth, red pepper flakes, bay leaves, saffron, paprika, black pepper. Cover and bring to a boil, reduce heat to a low boil, and continuing cooking approximately 10 minutes. Add sun-dried tomatoes, peas and shrimp, cover and continuing cooking 15-20 minutes (was 5 in original, but that didn't seem to cook the shrimp or quinoa fully). Remove from heat, leave covered and allow to set 10 minutes.